This GORGEOUS STUCCO Stoneybrook Villa is Unlike Any Other! EXPANDED to 1951 s.f. of Living Area. HVAC & Water Heater NEW in 2018. This villa has been GORGEOUSLY UPGRADED & IMPECCABLY Maintained. Hand-Scraped VOLUME Ceilings (KNOCKDOWN Finish - NO Popcorn!) Rounded (BULL-NOSE) Corners BEAUTIFUL High-End Laminate GORGEOUS Rectangular TILE in Kitchen. The Spacious Light & Bright Kitchen features STAINLESS STEEL Appliances NEW in 2017 CORIAN Countertops RAISED-PANEL White Cabinets w/Crown Molding and PULL-OUT Shelves. This Very Special Stoneybrook ALSO has an ENCLOSED & CLIMATE CONTROLLED LAUNDRY ROOM! The 3rd Bedroom (no closet) has been TRANSFORMED into a Fabulous Office/Den/Sitting Room w/a Built-In Desk. The large courtyard is LOW MAINTENANCE w/NO GRASS to mow & No Homes Behind! Enhanced Landscaping w/Stone. Exterior Paint NEW in 2018. This one's a DEFINITE MUST-SEE! To fully appreciate this beautiful villa click on the âTOURâ buttons to view the 3-D Tour & Video Tour. 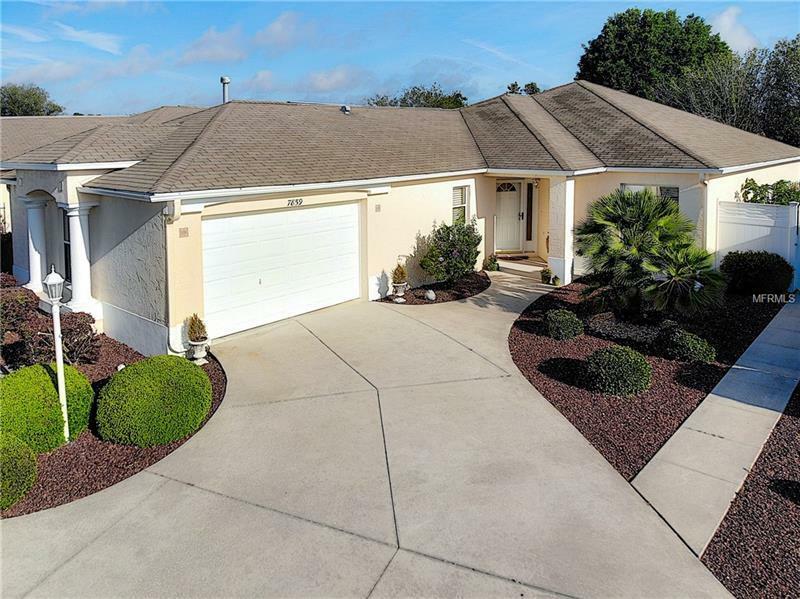 Great location that is easy in and out of The Villages. Close to Nancy Lopez Country Club Adult & Family Pools and Mulberry Grove Rec Center Shopping Banking Restaurants and the VA Center. Bond Assessment is $288/year (Bond Payoff is $2592). Maintenance Assessment is $356/year. Note: Square footage information is taken from the Public Record and is deemed reliable but not guaranteed. Room dimensions are approximate: buyer to verify. NOTE: Dining Rm Chandelier Living Rm Valance Master Valance & Lava Bowl in Den DO NOT Convey.